Yuja Wang was born in Beijing in February 1987 and was encouraged at a young age to make music by her dancer mother and percussionist father. She is an internationally recognized concert pianist and has a record contract with Deutsche Grammophon. 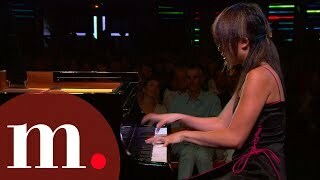 Yuja started playing the piano at the age of six and the following year she went to study at Beijing’s Central Conservatory of Music. In 1999 she moved to Canada and enrolled as the youngest ever student at Mount Royal Conservatory. Wang’s talent was widely recognised in 2001 with her appointment as a Steinway Artist. The following year, she was offered a place at Philadelphia’s prestigious Curtis Institute of Music where she studied with Gary Graffman. In March 2007, she replaced Martha Argerich at short notice in performances of Tchaikovsky’s Piano Concerto No.1 with the Boston Symphony Orchestra. In January 2009 Yuja Wang became a Deutsche Grammophon recording artist. She released her first CD, Sonatas & Etudes in 2009, followed by Transformation in 2010; Rachmaninov in 2011; and Fantasia in 2012. Wang toured Asia in November 2012 with the San Francisco Symphony and its conductor Michael Tilson Thomas. Throughout her career, she has worked with talented artists such as Claudio Abbado, Daniel Barenboim, Valery Gergiev, Michael Tilson Thomas, Antonio Pappano, Charles Dutoit, and Zubin Mehta.